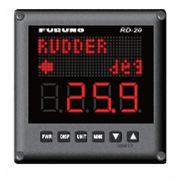 The RD20 is a remote display unit capable of displaying a variety of data from onboard sensors. The RD20 shows data in alphanumerics on its red LED panel. Up to 10 displays can be connected with a daisy chain cable, and the display brilliance of all units connected can be centrally controlled from 1 dimmer controller.